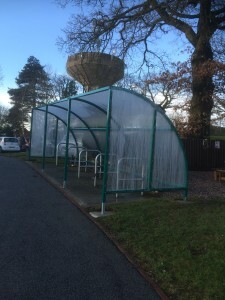 Working alongside our clients FM team, ABC were commissioned to design, supply and install this stylish bicycle shelter. The sloping ground conditions were overcome by using adjustable riser legs bolted to the new concrete pads finished at relevant ground level. Available in a range of sizes and colours and various options on bike racking arrangements, all available as part of the bicycle shelter design.